The world was not designed to meet my needs. Everything from the size of my computer keyboard to the measurements of my one-size-fits-all articles of clothing to the frigid temperatures I’m forced to endure in office buildings was determined to meet the needs of—you guessed it—men. But it’s time for me, along with the rest of womankind, to be seen and accounted for. The data that researchers collect severely underrepresents women. It often does not take gender into account, and it certainly is not intersectional. And yet, opinions are formed, decisions are made, products are produced, and medical advice is given based on incomplete—arguably false—data. How can data be accurate if it accounts for barely half of the population? It can’t. And we need to do something about it. We all know that women are underrepresented in the world. 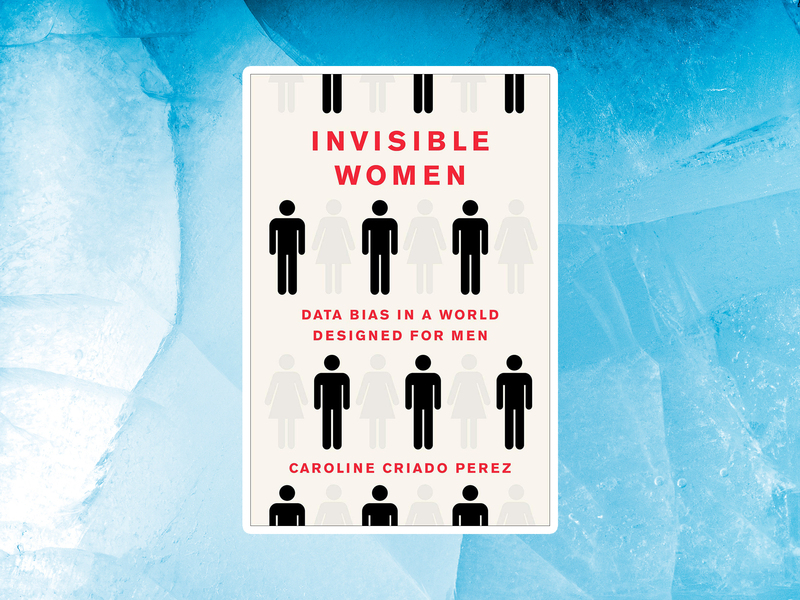 But in Invisible Women: Data Bias in a World Designed for Men, British writer, feminist, and activist Caroline Criado Perez digs into the root of the problem. She points out the alarming gender data gap in every area of our world: in daily life, the workplace, politics, urban planning, and at the doctor’s office. In her words, “Invisible Women is the story of what happens when we forget to account for half of humanity.” Half. Of. Humanity. I spoke with Criado Perez about the gender data gap, the “hidden hurdles” of being a woman, and how we can challenge male default to design a better, more inclusive world. HelloGiggles: When did you first start examining the gender data gap so closely? Caroline Criado Perez: There was an immediate trigger that made me want to look into it. I came across the fact that what I’d always been taught about heart attack symptoms are, in fact, typical male heart attack symptoms, and that women tend to have different symptoms. Not only do women not know this, but also, doctors are missing women’s heart attacks—and women are more likely to die of a heart attack than a man as a result. I was incredibly shocked, for a start, that I didn’t know. And that I, I think along with other people, had just thought of heart attacks as something that happen to men; that if I were having a heart attack, I should be looking out for the pain in the chest and down the left arm. To discover that was not the case, and that it wasn’t just people like me who didn’t know—it was also doctors who were failing to spot it—was incredibly shocking. I knew, and a lot of people know, that we have a female representation problem when it comes to culture. We know that women are underrepresented in the media and in films and in politics. But we’re taught that science is rational and objective, and that facts are facts, and that’s it. So to discover that that wasn’t the case, and that science—particularly medical science—suffers from the same problems as the rest of society, was really shocking. It was 2015 when I came across [the difference in heart attack symptoms], and I couldn’t quite believe that in the 21st century, we were letting women down so badly when it came to medical research. That made me start looking into it, and I realized it’s everywhere. HG: The biggest thing I can’t stop thinking about is, just like you said, even facts contain distorted accounts of humanity, because they don’t consider half of the population. When did you realize that? But then, when I went on to read further, [Cameron] explained that when women see or read the word “man,” they unsurprisingly picture a man. And I say “unsurprisingly,” but that was actually a massive shock to me. Because I realized, for the first time, I was picturing a man when I heard those words. More shocking was, how had I got to the age of 25 and never realized this? It was so automatic and so subconscious. When I tied that in with the way I had so much contempt for women growing up, despite being one, it made me incredibly angry. It felt like I’d been sold a lie. I don’t want to say I was destined to write this book, but this was a book I was going to end up writing one way or another, because this is the thing that made me feminist and that drives me. HG: Invisible Women includes many examples of areas where there’s a data gap. Some of them are quite unexpected. In your research, did you uncover any data gaps that really shocked you? CCP: I think they’re all really shocking. [Laughs.] Obviously, the medical stuff is incredibly shocking, because the outcomes are so severe. It’s incredibly annoying having a phone that’s too big for my hand and that gave me RSI [repetitive strain injuries]. I feel resentful that I’m paying the same price for a phone that I can’t use as well, but I’m not going to die from that. But I am going to die—or I’m more likely to die—if I’m in a car crash, because I’m one of those women who sits “too far forward,” because I need to reach the pedals. Even that language—the idea that it’s the women who are out of position, not that the car hasn’t been designed to fit them properly. It’s that the pedals are too far away, not that I’m not too far forward. Inevitably, I think the [examples] where women are being seriously injured or dying are the most shocking. But obviously, other things can have a massive impact on your life. If you’re a really talented female pianist, the fact that the keyboard has been designed for hands bigger than yours puts you at a massive disadvantage. That can have a huge impact on your life, more so than my smartphone. It’s not going to affect me professionally in the same way, it’s just incredibly annoying and unfair. If I had to pick out something that made me the most angry, it wouldn’t necessarily be one of the examples. It would be the excuses. Because at that point, you’ve moved beyond not really thinking, and you’ve moved beyond it just being a failure to remember that women exist. At that point, you’ve moved into the realm of, “Actually, this just isn’t that important.” This is people who will know that women are dying as a result. How do you explain that? I have faith in humanity, and I don’t believe that people are really thinking this through. No one can really be thinking, “Oh, never mind that women are more likely to die in a car crash, and never mind that women are dying from heart attacks that could have been prevented.” I think it goes back to the male default thinking—they’re so used to thinking of men as the standard humans, that it becomes much easier to justify excluding women. It’s a matter of not thinking logically. HG: How do people justify excluding women? CCP: This excuse comes up in all fields, from transport to the economy to medical research: Women are just too complicated to measure. In medical research, that would be because of our menstrual cycles. The argument is that women are too variable: It costs too much and you have to test them too often, so it’s just easier to [test] men. Which would only make sense if you think that women aren’t 50% of the population. When you remember that women are 50% of the population, you’d realize, “No, we actually have to test these bodies.” They’re not just weird, deviant bodies. They’re pretty normal, and they’re the ones that are going to be having these diseases and taking the drugs that we’re testing. But eventually, when the women take the drugs, women are forced to be guinea pigs. Is it surprising that women have more adverse reactions than men? Is it surprising that so many drugs tested are withdrawn from the market because of unacceptable side effects in women? None of this is surprising. The other excuse is that we haven’t tested on women in the past, so we can’t start now, because there’s no comparable data. Again, that only makes sense if you aren’t thinking of women as just as standard a version of humanity as men. That only makes sense if you somehow still manage to cling onto this belief that men are human, and women are women. HG: You point out that unpaid work does not just benefit a woman’s family or self. Whether we realize it or not, it’s for society, and it’s built into our societal system. What would happen if women just stopped doing unpaid work? CCP: We have a very good example of what would happen: It happened that day in Iceland, when women went on strike. Basically, Iceland came to a standstill, and they very rapidly introduced a lot of pro-women legislation. It opened the eyes of the country and made this invisible work visible. All sorts of things wouldn’t happen: children wouldn’t get to school, they wouldn’t get taken to the doctor, they wouldn’t get their vaccinations. The toilet wouldn’t get cleaned, the washing wouldn’t get done, the food wouldn’t be cooked, the elderly relatives wouldn’t be visited, and no one would have remembered to send a birthday card to the in-laws. Ultimately, that would have an impact on the paid economy as well. If you haven’t been fed and you haven’t been clothed and your house is a tip, you’re not going to perform very well at work. Also, if the next generation hasn’t gone to school and hasn’t been taken to the doctor for their jabs and hasn’t been clothed or fed, they’re not going to be in a position to go into the world of work and earn the wages that pay for people’s pensions in their old age. We’re all relying on this unpaid work that women do for the world to carry on moving. But because we only measure the paid work that people do, we’re able to pretend that it doesn’t matter and doesn’t exist. This is a matter of economics, but it’s also a matter of life or death in certain situations. HG: People love to perpetuate the myth that women can’t be in charge because they’re too emotional. But you point out that having more women in positions of power would make a tremendous difference. CCP: Women are more likely to know what other women need, because it’s a need they’re likely to have as well. A good example of this is the story Sheryl Sandberg tells about getting pregnant while she was working at Google. She was crossing the carpark, and she was struggling because she was pregnant. She was in a high enough position to be able to go into the boss’s office and say, “You need to put in pregnancy parking.” And he said, “Yes, of course. I’d never thought of that before.” I think it’s very interesting that she says that she felt bad that she hadn’t thought about it until she got pregnant. But that’s exactly the point. That exemplifies the whole issue of why you need diversity of representation at the top. I wouldn’t know. Why would anyone know unless they’d experienced it? Well, I’ll tell you how they could know: They could be collecting data. Google could have gone to their female employees and said, “What do you need at work to be comfortable?” But the reality is that it usually takes a woman in a position of power and seniority to experience whatever it is for that to change. It shouldn’t necessarily be that way, but it just is that way. When you look at politics, studies from around the world over decades have shown that female politicians are much more likely to prioritize issues that affect women, like childcare and maternity leave. They’re more likely to raise issues of care and education. Conversely, men, for example, are much less likely to put their names to a bill if it’s presented as a women’s rights issue rather than a human rights issue. There’s no doubt that while it would be really lovely if men could represent women as well as women can, they just don’t. Part of that is just not being aware. The other is that both men and women suffer from male default. I suffered from male default growing up. I still do; I just try and correct it. You can’t ignore the difficulty that women who aren’t in positions of power will experience or feel about speaking up on behalf of other women. Because women get penalized for that. It’s not just that men aren’t thinking and they aren’t asking women and they aren’t collecting data. Even if they were, it would be harder for women who aren’t in a position of power to speak up about what they need. If you want things to change, women need to be in positions of power. HG: What opportunities do regular people have to close the female representation gap that they might not realize are opportunities? CCP: Challenging male default. Don’t allow the male to occupy the default. When you’re talking about football, say “male football.” Don’t allow the male to occupy the default. When you mean men, say “men.” I really do think that’s half the battle. As women, we already don’t notice male default. But we notice it a bit more because we’re being excluded. If we think about it, we realize, “Oh yeah, that doesn’t mean me.” But men never have to experience that, because they are always included. By constantly saying “male ___” when you mean “male ___,” it helps to make the way that men go without saying, visible. Unless you’re highlighting when you’re talking about men, men don’t realize that they’re going without saying, because they assume that women must be going without saying as well. We have to make men go with saying. HG: If datasets already underrepresent women, I imagine the datasets for female minorities are practically nonexistent. Is there anything we can do to better account for them? Or do we need to expand our definitions of inclusivity? CCP: It’s something I found frustrating when I was writing [Invisible Women]. Intersectionality basically doesn’t exist in data. Data is a perfect example of what Kimberlé Crenshaw was writing about women of color having to choose between, “Am I black, or am I a woman?” when it comes to discrimination cases. That’s still going on. If you’re looking at representation data for college professors or in films, I certainly couldn’t find any. That’s not to say there isn’t any, but from what I could find, you have “men” and you have “women”—when you have women at all. But when you have data separated, it’s “women” and “people of color.” Women of color are lost between the two larger groups. The truth is that you know that women of color are making a much smaller proportion of both the ethnic minority stats and the female stats, but you don’t have the numbers. And you need the numbers. You need the numbers to change anything, particularly in the world that we’re living in. It’s an increasingly data-driven world, and anyone who doesn’t have data on themselves is in a much, much harder position to push for equality. Invisible Women: Exposing Data Bias in a World Designed for Men is available wherever books are sold.